I love to cook and bake, but I fail from time to time. Not too long ago, I called Dan in tears asking him to bring home supper because I'd completely botched a new recipe and I had to toss it all in the garbage. Ugh. And yet I keep trying to make new things, because I'm hard-headed. 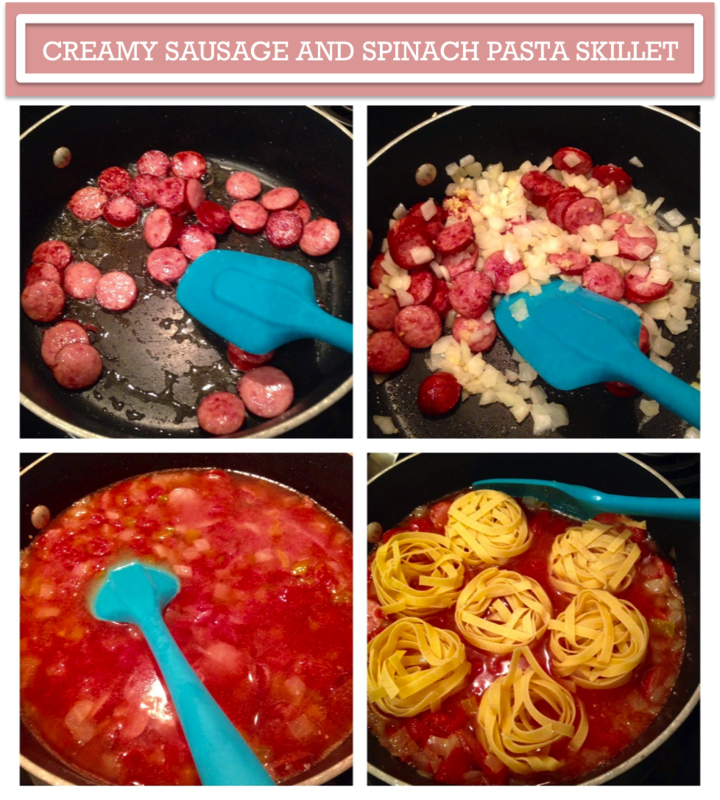 This Creamy Sausage and Spinach Pasta Skillet was something I saw via Pinterest; I must admit the one-pan concept really had me interested given weekday dinners are challenging. I loved that this recipe called for less than ten ingredients. That's a win there. I used fettuccine nests because I knew they'd submerge more easily than other long noodles; I plan to make nests from now on when I do fresh pasta! Overall, this was a super easy process, to the extent that I almost laughed. Watching this come to life made me feel like a super cook, no idea why as it was so simple. I think I was just overdue for a kitchen success after a string of failures and "meh" meals. Overall, I declared this a Pinterest win. It was tasty (we both went back for seconds), and I would not hesitate to make it again. Here is the recipe if you'd like to give it a try! Changes I would make? Double the sausage (I like meat, what can I say?) and use diced tomatoes with basil/garlic/onion vs. the chiles; the chiles weren't our favorite flavor enhancer in the dish. I'd prefer something a little more traditional I guess. I also added herbs and spices to my own taste, which I always recommend, because cooking. 1000th Post... and a fresh look!